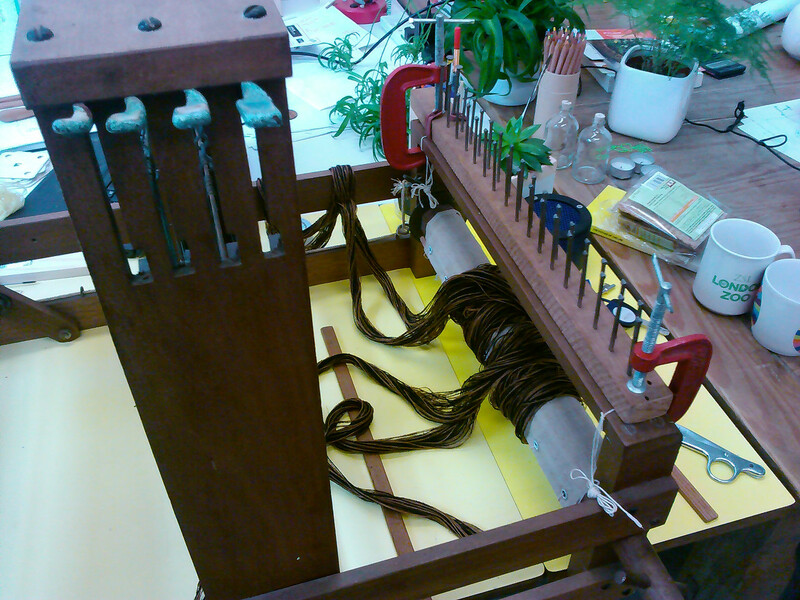 The next stop on my exploration of loom technology for the weavingcodes project (after building a frame loom and learning tablet weaving) has been learning how to use a 4 shaft table loom. 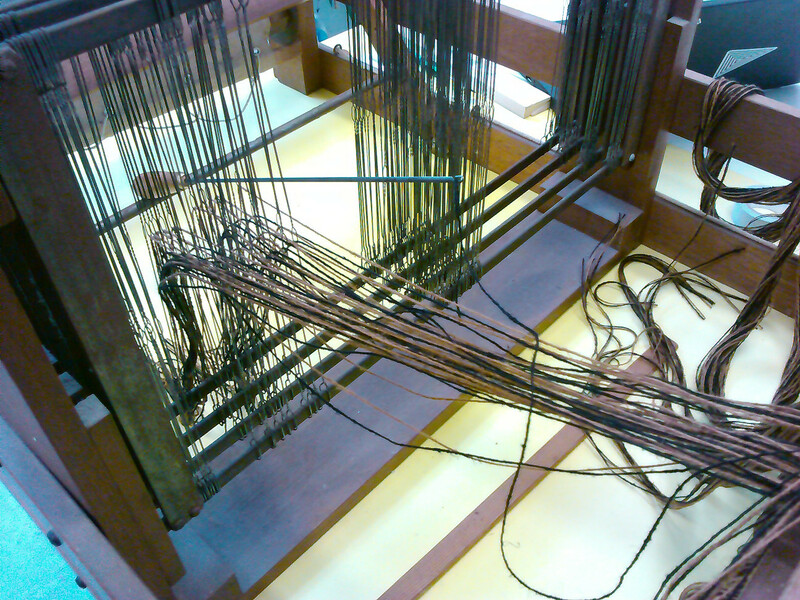 This has been kind of daunting to me, as it’s a much more modern weaving device than I’ve been working with up to now (frame looms and tablet weaving can be considered to be both neolithic digital tech). I also couldn’t really figure out much from books on the warping techniques, as it’s difficult to get the idea through images – so I had to just kind of jump in and try it. I decided to use the double weave draft plan to start with from my last post – partly as I want to try this technique, but also it’s pretty simple warp threading for a first attempt. This yarn is about 10 threads per centimetre, so we can use that to figure out roughly how many warp threads (or ‘ends’) to use – I decided on 160 ends in total (so ~16cm wide) comprised of the two alternating colours. I wound out two sets of 80 threads over a couple of metres, doing both colours at once to make it easier. I then attached each one to the back roller and wound them in a bit – this would have worked better later if I had used more bundles of fewer threads. 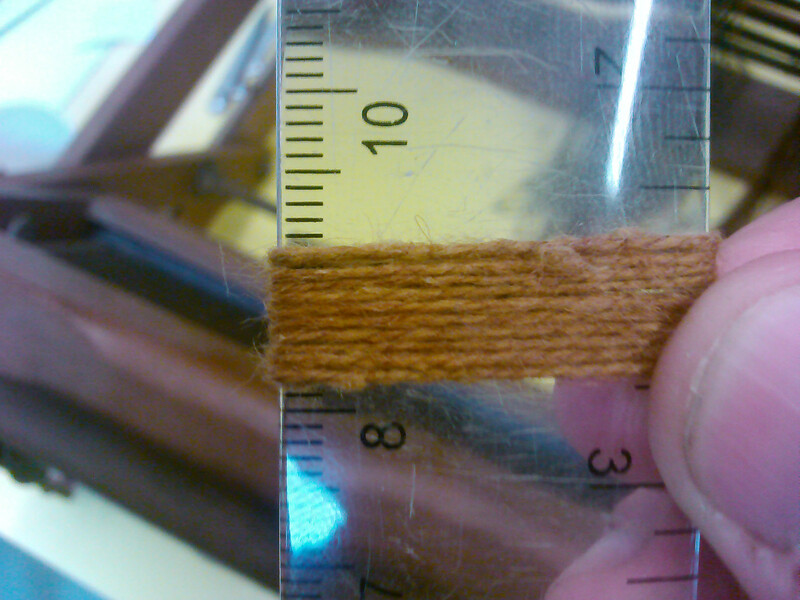 You can see in the picture I’ve also bolted a “raddle” (thing with nails) on the back beam of the loom to help space out the warp threads – this is important later on. Now we come to the heddles. 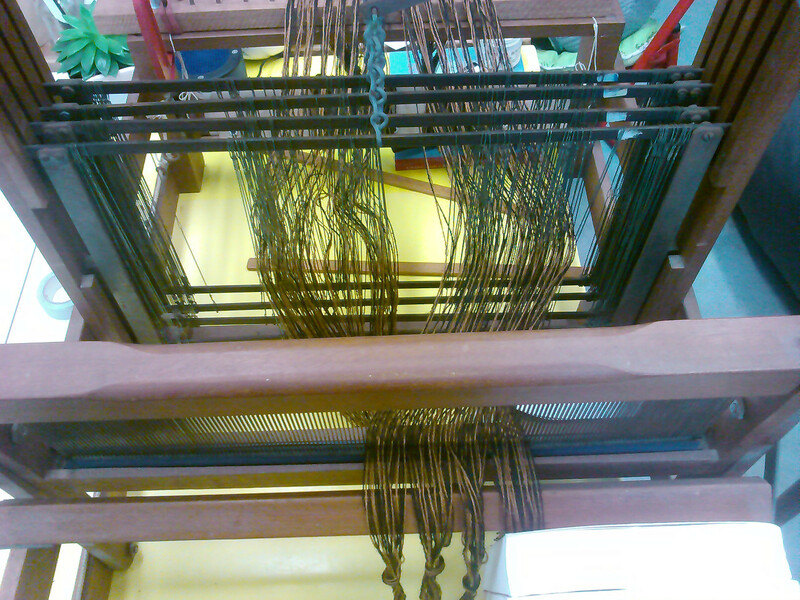 The threading chart is what programs this part of the loom, which in turn forms a fixed instruction set of pattern possibilities for the weave. You can see the 4 levers that operate the frames in the photo above – these essentially give us 4 bits per weft of information. 2 of the 16 possibilities are invalid – as all frames raised or lowered doesn’t provide a working fabric. 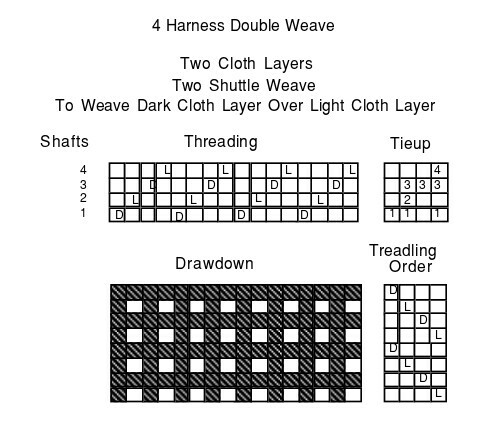 Using different sequences of these 14 combinations for each weft thread, the possibilities become mathematically huge – even with a fixed warp like this. Reading the frames and warp colours from the chart to provide a sequence, you hook each warp end through the eye of the heddle – this was the most time consuming part of the process. Once that is done, the reed – which is attached to the beater and used to pack down and keep the fabric evenly spaced, is threaded (or “sleyed”). The reed I used was a bit too course so I used two threads per gap – this could have done with being a bit more as it turned out. With all this done the warp ends can be attached to the front roller and the whole warp can be wound on through the heddles and back again to check the tension. Of course in practice (and as it was my first time) it actually involved a lot of tangles and swearing, and two broken warp threads, fairly easily knotted back together. The raddle was essential in helping untangle the warp threads, but I also had to fiddle around with the tension a lot, retying the knots attaching them to the rollers and using plenty of sticks (it seems you can never have too many sticks when warping a loom). 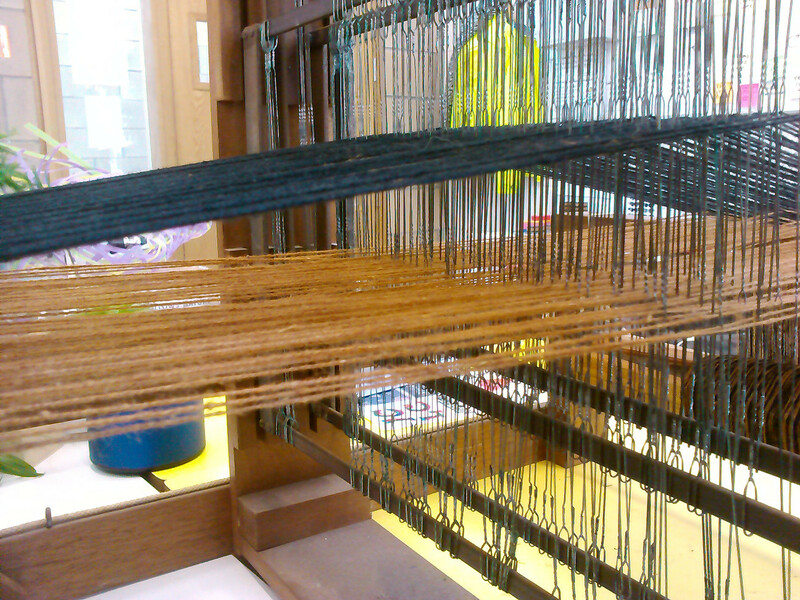 This is a test that the warp is threaded correctly, with all black threads (frames 2 and 4) lifted – phew! 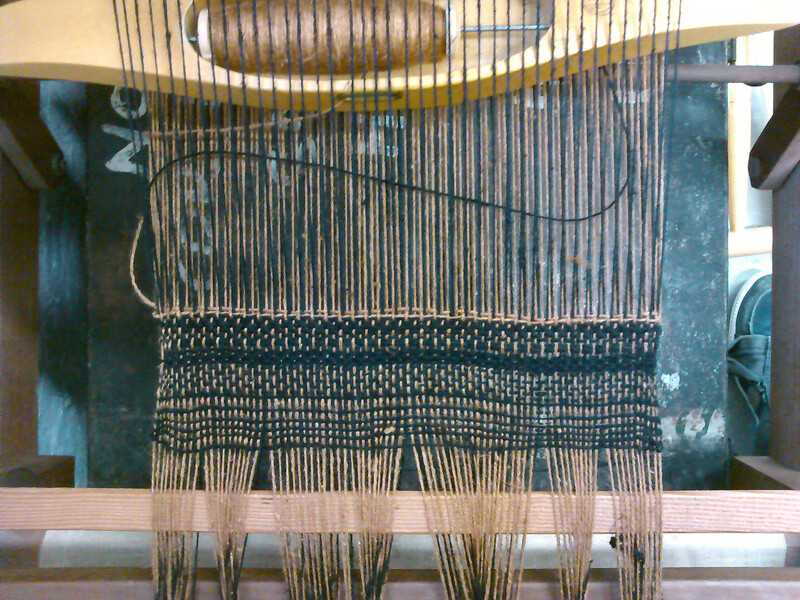 After that we could try a little test weaving, going freestyle on the heddles. It turns out the reed is a little too wide, meaning it’s stretching the warp out as the woven fabric finds it’s true width – switching to a new one is possible without needing to do the heddles again, so we’ll see how it goes. Compared with tablet weaving, this is far more mechanised and efficient in terms of fabric production, but the flipside to that is that you lose a lot of flexibility, and the loom is less responsive to particular material properties like this. Thanks Alison, that is great to hear. Yes, I had the same experience looking for information online – a lot of it seems to assume prior knowledge on critical aspects. Just found this post. I’m just getting started with weaving. I will find your other posts, find this very interesting. Hope you are still weaving as I need a mentor. Yes I’m still weaving! Although more with tablet weaving recently – our new project is here: https://penelope.hypotheses.org/ feel free to ask questions.